Oregon Sea Grant will receive $3,000 on Feb. 3 from the Siletz Tribal Charitable Contribution Fund to support field trips to Oregon State University’s Hatfield Marine Science Center (HMSC). “This grant will allow up to 30 classrooms from schools with low-income populations in the tribal service area to visit the center and learn about coastal habitats and marine research,” said Kathryn Hawes, the coordinator of Oregon Sea Grant’s marine education program. The program offers classes and camps for K-12 youths. 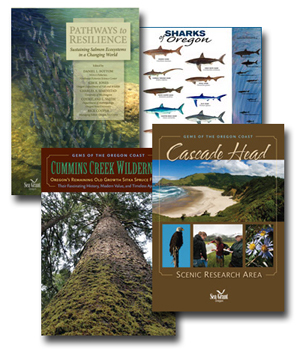 The activities take place at HMSC, where Oregon Sea Grant’s Visitor Center is located, and in the nearby Yaquina Bay estuary. This program serves approximately 9,000 students each year, Hawes said. Oregon Sea Grant will allocate the field trip scholarships on a first-come, first-served basis to Title 1 schools in the Siletz tribal service area. For more information and to apply, visit http://hmsc.oregonstate.edu/visitor-center/webform/2017-scholarship-application. 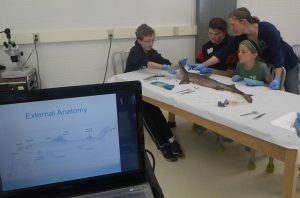 The grant will be awarded Feb. 3 at the Chinook Winds Casino Resort in Lincoln City during a ceremony that begins at 6 p.m.
Photo (above right): Students learn how to dissect a shark in a 2016 camp offered by Oregon Sea Grant’s marine education program, which is based at the Hatfield Marine Science Center in Newport. Oregon Sea Grant has received a grant from the Siletz Tribe that will allow low-income students to participate in similar educational activities at the center. Photo by Hana Laughton. 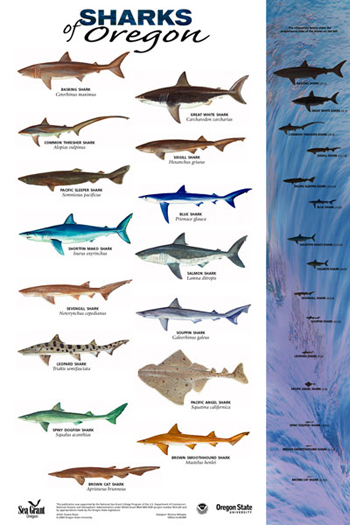 NEWPORT – Did you know more than 30 species of sharks can be found off the Pacific Northwest coastline? Learn more about them this Saturday, Jan 24, as the Hatfield Marine Science Center celebrates our annual Shark Day! Stop by the Center between 10 am and 4 pm for shark-themed exhibits, biofacts, films and kid-friendly activities related to these fascinating sea creatures. Afraid of sharks? How about vending machines? You might be surprised to learn which is more dangerous to humans! Make sure to be here at 1:30 pm. to watch and listen as Dr. Bill Hanshumaker, Oregon Sea Grant’s chief scientist at the Visitor Center, conducts a necropsy on a salmon shark and talks about the animal’s biology, life cycle and habits. Follow shark conservation scientist and blogger David Shiffman at Southern Fried Science (or on Twitter as @WhySharksMatter) to learn shark fact from shark fiction. Shark Day at the Visitor Center – now with live Web stream! 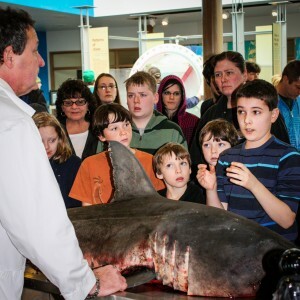 NEWPORT – Shark Day is returning to the Hatfield Marine Science Visitor Center this Saturday (Jan. 8) – and this year, Internet audiences are invited to join in learning more about these fascinating marine animals via a live-streamed shark dissection and “ask the scientist” chat. At 1:30 pm (Pacific Time), Bill Hanshumaker, Sea Grant public education specialist, will be dissecting a seven-foot salmon shark (Lamna ditropis), which has been in the deep freeze since it was hauled up as by-catch by a hake trawler last summer and donated to the center. Dr. Hanshumaker will systematically dissect the shark to reveal its nervous, circulatory, digestive and reproductive systems, and talk about shark biology and adaptations. This year’s Shark Day dissection will be streamed live over the Web via the center’s ScienceCam – and a new feature will allow Internet visitors to join in a live, moderated chat where they can ask questions about shark biology and behavior. Follow this link to view the dissection live and find out how to take part in the live chat. Samples of the shark’s tissue and vertebrae will be collected and passed on to researchers who will determine the animal’s age and test test for parasites and mitochondrial concentration. The specimen is on display at the Center today and through Saturday, until the dissection. The ScienceCam is one of the Visitor Center’s new initiatives to expand marine education and outreach offerings to those unable to visit the Oregon Coast. In addition to occasional public presentations, it is being used to stream marine science demonstrations to school classrooms, many of them far from the ocean.